The 1977 United States Grand Prix West (officially the Long Beach Grand Prix) was a Formula One motor race held on April 3, 1977 in Long Beach, California. It was the fourth race of the 1977 World Championship of F1 Drivers and the 1977 International Cup for F1 Constructors. The 80-lap race was won by Mario Andretti, driving a Lotus-Ford. Andretti held off Niki Lauda in the Ferrari to become the first American to win a Formula One race on home soil, while also giving the ground-effect Lotus 78 its first win. Jody Scheckter finished third in the Wolf-Ford. The Formula One circus arrived at Long Beach in mourning following the deaths of Tom Pryce at the South African Grand Prix and Carlos Pace in a light aircraft crash near São Paulo. The Shadow team signed Alan Jones as Pryce's replacement, while Pace's place at Brabham was taken by Hans-Joachim Stuck. Stuck had been expected to drive for the new ATS team with its old Penske car but changed his mind, meaning that ATS had to sign Jean-Pierre Jarier instead. The first practice session saw Jody Scheckter fastest in the Wolf with a time of 1:22.79, just ahead of Andretti in the Lotus 78. In the second session, Andretti went faster with a 1:22.06, but Ferrari's Niki Lauda took the pole position in final qualifying on Saturday with a 1:21.63. Scheckter was third, joined on the second row by the second Ferrari of Carlos Reutemann. On Sunday, it was over 100 degrees as the cars formed on the starting grid. At the green light, Scheckter shot past both Lauda and Andretti, and led into the first turn. Reutemann pulled next to Andretti on the inside approach to the turn, but braked too late and slid straight on. Andretti avoided a T-bone by braking in time to duck behind him into the corner. James Hunt was allegedly pushed from behind, though no one knows for sure, and when he hit John Watson's right rear wheel with his left front, he was launched six feet in the air, showing Watson the entire underside of his McLaren. On landing, he slid past Reutemann and down the escape road. Hunt was able to make it back to the pits, and though his suspension was bent, he carried on, and ended up missing a point for sixth by just two seconds. Meanwhile, the trio of Scheckter, Andretti and Lauda continued the battle they had been waging all weekend, with Scheckter leading by 1.7 seconds after three laps. On lap 4, Lauda was pressuring Andretti and tried to pass in the hairpin at the end of the curving back straight. He locked the Ferrari's brakes, but kept his foot down hard to avoid hitting Andretti's Lotus. The resulting flat spots on Lauda's tires caused a serious vibration throughout the race, and probably took away his chance of winning. Scheckter maintained a consistent cushion over the battle for second; after 25 laps, Andretti was 2.5 seconds behind and Lauda was 4 seconds back. Even as they periodically worked their way through traffic, the three leaders never lost contact for more than half a lap. 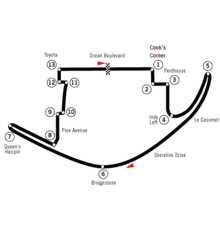 The Long Beach circuit was not particularly suited for cars that generate a lot of downforce, and the new Lotus, with its higher aerodynamic drag, could not match the straight line speed of Scheckter's Wolf; Andretti continually closed in through the corners, but could not find a way past. "I was preparing for a real banzai under braking," Andretti later said. "I needed to go from fifth to first gear in order to do it, and the way the gearboxes were in those days, I had maybe one or two tries to do that. My objective was to do it if I was in a position at the end of the race. Then I saw a twitch and, obviously, he had a tire that was slightly deflating." On lap 58, Scheckter's lap time suddenly increased by two seconds, and as he passed the pits, he pointed emphatically to the crew at his right front tire, which had developed a slow leak. The tire began locking up time and again under braking, but Scheckter decided he was going to stay out and go as far as he could. For 18 laps, he tenaciously fought a losing battle as he held off each of Andretti's desperate attempts to pass as his deflating tire got softer and softer. "It was not at the point that the tire was really going down, because it was the left side, not the right side, and it was not to the point that he really backed off any sooner because his braking point and turning point for the corner was the same." On lap 77, Andretti outbraked the Wolf and pulled inside him entering the hairpin. "It's not that he went wide," he said afterwards, "I just got him clear at the braking point, and then after I went by him, I distanced myself." The frenzied crowd of 70,000 finally burst into rapturous applause as Andretti accelerated into the lead. Scheckter's despair was complete when Lauda also went by on the next lap. The crowd cheered Andretti home, deflecting considerable pressure from Lauda right to the flag, as he won by less than a second. "It is one of the nicest moments of my career, even more satisfying than winning Indianapolis and really gratifying to have so many people pulling for me," Andretti said. "The car remained perfectly balanced throughout the race and the brakes were superb." "It was not that I was given a break," Mario still insists. "I outbraked him clean. To me, it was just as satisfying a win. Jody tried to say that the only reason I passed him was because the tire was going down; but if that was the case, he would have had a lot of smoke and a lot of locking up, and there was none of that. So, it was a good, satisfying win." Scheckter held on for third place, and the scoring was completed by Patrick Depailler's Tyrrell, over a minute behind; Emerson Fittipaldi in the Copersucar; and Jarier in the ATS Penske-Ford. ^ "Weather information for the 1977 United States Grand Prix West". The Old Farmers' Almanac. Retrieved November 17, 2013. ^ "1977 Formula 1 World Championship Programmes". The Programme Covers Project. ^ "The United States Grand Prix West: The Racer's Racer Wins at Home". Motor Sport. London. May 1977. p. 57. Retrieved October 21, 2017. ^ "1977 USA West Grand Prix". formula1.com. Retrieved 7 October 2017. ^ a b "United States West 1977 - Championship • STATS F1". www.statsf1.com. Retrieved 21 March 2019. Rob Walker (July, 1977). "2nd United States Grand Prix West: Patience At 11,000 RPM". Road & Track, 112–117. Gordon Kirby (April, 1997). "Proof of Concept". RACER, 68–103. Pete Lyons (April, 2002). "One Day At The Beach". RACER, 74–78.